Bear in mind, if you show up on Wednesday and check in early there will not be a free shuttle to the convention center or likely FROM the convention center due to limited Wednesday hours. Some of the hotels in Mission Valley will also be offering special incentives for those booking early. Be sure to review the list below for details. Rates listed below are for 1 or 2 people in each room. Additional people in the room may increase the room rate. You will be able to see these additional rates before confirming your reservation. 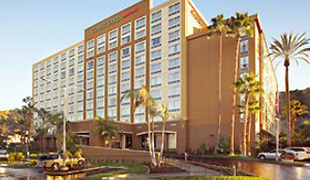 DoubleTree San Diego Mission Valley 7450 Hazard Center Drive 4-night minimum stay will include 1/2 off guest room Internet and continental breakfast.